…When they are healthy and well? For many years the healthcare system has made it possible for people to engage in their medical decision-making process when a medical crisis or unanticipated diagnosis happens. This approach is reactive to a crisis and creates hardships for many during a very difficult time. The most important aspect of Advance Care Planning is picking someone to be your medical power of attorney; someone who will make medical decisions with your doctor about your medical care and treatments if you are not able to participate in this process during a health crisis. Research shows that less than 30% of adults have engaged in this aspect of their healthcare, and yet, studies show further that 93% of adults would like to have these conversations with their doctors. I believe this research is biased based on which adults were asked this question! This studies do not indicate who and how old (or young) the adults were when asked about their Advance Care Planning. What this means for us today is that more adults under the age of 60 than older and are not given information or support in participating in their healthcare choices. This needs to change. Every adult, 18 and older, are able to prepare for healthcare services. One of the best ways to partner with your doctor is to have ongoing conversations about what is meaningful in your life today that matters to and how this relates to your health and well-being. Don’t Wait to Communicate! Talk to your doctor, family, friends about who you are today and what matters in your life while living healthy and well. Visit Jo’s website if you are in need of care, extra love and attention, and a tendency toward laughter in the face of turmoil in whatever life has thrown at you. A legal document has certain components that are recognized by various professionals and institutions in society for the benefit of communication and decision-making. These legal documents contain both information and signatures that are then recognized by professionals so people can take certain actions or not. 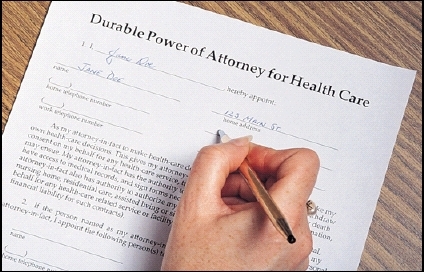 Advance Directive forms fit into this category of legal documents. The difficulty appears when people are intimidated by the form and the legality of them so completing Advance Directives is not as easy as most health care professionals might want. One form of Advance Directives that is accepted in most states is called The Five Wishes. This document, designed by Aging with Dignity in Florida offers a collection of Wishes that you can consider for yourself when you need health care services. It is best to complete the Five Wishes when you are calm, quiet, and have time to reflect on the statements that this document offers for you to consider. After you have completed The Five Wishes, go over your decisions for health services with your family members, your doctor or a close friend that you would trust to follow your preferences when medical decisions need to be made and you may not be able to participate in the conversations. If you want a more detailed, comprehensive, narrative documentation that covers more depth and understanding of you as a person before you become a patient, contact Nancy True of Unlimited Grace LLC and schedule a “Graceful Conversation” that will capture your uniqueness in a personalized written record of your medical preferences. Quality Health Care is available every day during hospitalizations, in Long Term Care Facilities, and Hospice Care. Your health care professionals want to offer you their best care, every time, all the time. Their ability to care is unique at a time when so much seems to be changing or uncertain as to how we will be able to receive Health Care Services. A very important action that everyone needs to take as they consider health care services is to write their medical preferences down and share them with family and health care professionals. This, I believe will not change, even as we consider very significant changes in our health care system. Preparing your Advance Directives is your right to self-determine your medical preferences as to what you want and what you don’t want to receive when you need to consider medical treatments. Your right to record your medical wishes is one the best ways to ensure that you will be cared for properly and receive individualized treatment options concerning your medical needs. Don’t wait until you are in the hospital or the nursing home or entering hospice care to write down what you want your health care professionals, family members, and friends to know about you as a person before you become a patient. As A Clinical Chaplain serving in the health care system for over ten years, I’m here to say that I have met some of the most caring, compassionate, and dedicated professionals within our health care system. Please take the time to prepare your Advance Directives so you can be assured good quality health care. Complete The Five Wishes for yourself or contact Unlimited Grace LLC and ask about the Graceful Conversations program to prepare a personalized narrative document that contains your personal preferences for medical treatments and health care.